Skye Walker is a street artist from Encinitas, CA, whom we met when he was creating a terrific mural for the Ecwid HQ. He’s got a degree in graphic design and spends his time working on murals, surfing, snowboarding, and playing the banjo. At the same time, he sells art on his website. We chatted with Skye about the artist’s life, e-commerce, web design, and the story behind the Ecwid mural. Modern art can sometimes be hard to understand. So it might be difficult to know if you are an artist by nature. We wanted to look back on Skye’s childhood to find out when the talent showed up for the first time. When I started drawing cartoons as a kid and creating characters, worlds, and places that I could control with my pencil or paintbrush, it was addictive. It’s all I wanted to do! At a young age, it was about the fun of it all… As you get older, you just want to refine your skills and become better and prove to yourself and others that you create art for a reason. But at the core of it… I do it because it’s fun. Skye’s parents are musicians, so he was often involved with their tours when he was a kid. Is the art talent purely a gift or a result of being brought up in a creative community? For sure, I think it totally is a factor and certainly helps in the growth of a young artist. But parents don’t have to be artistic, they just have to encourage their kid to pursue their dreams of art if they recognize that their child has an affinity with it. 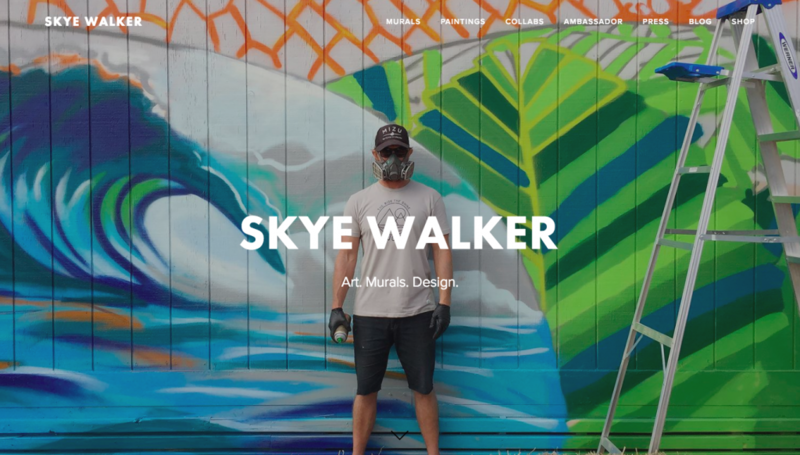 Murals helped Skye become known — when hundreds of people can see your art day by day, it can work better than holding a gallery. 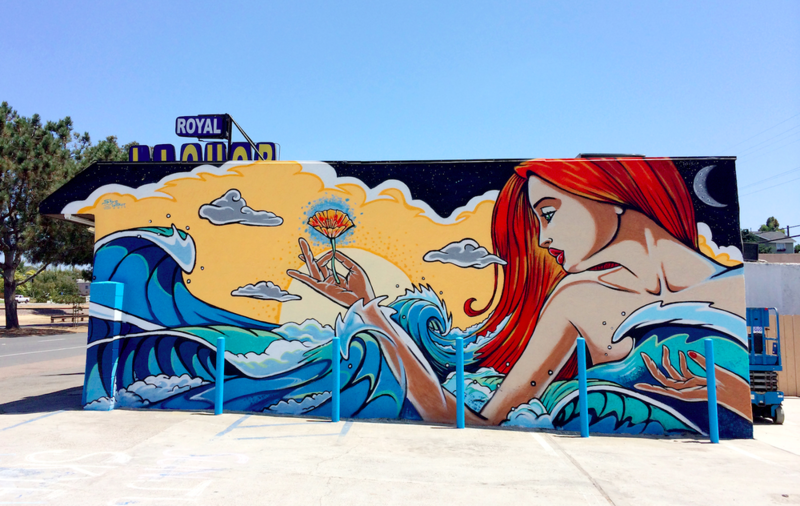 In 2014, Paint Encinitas chose me to do the first mural for their mural program at Royal Liquor in Leucadia. I painted a piece called Remember California, which was an homage to mother nature and the ocean. Paint Encinitas is a non-profit all on its own that gets lots of artists to work with them. But my first murals in Encinitas were at the Whole Foods market, and I painted the whole store and parking garage, which led to me painting murals for all the Whole Foods in San Diego county. Painting murals on a large scale is the best way to share art with the public. If I sell a painting and it goes into someone’s home, then it sits in their home and only a few people see it. But to create something stunning that thousands of people see daily, that’s going to make a lasting impression on people and hopefully inspire some as well. Ecwid is synonymous with global: not only do Ecwid stores open in 175 countries, the company itself is a mix of cultures. With HQs in Russia and the US, Ecwid unites people living and working with an 11-hour time difference and diverse mindsets. When I met with Ecwid, Ruslan said he really liked the space suit of Russian astronaut Yuri Gagarin… then I suggested putting Yuri on another planet with waves rolling in… and he was excited about this idea. So that’s what we did, and it links the history of Ecwid with its connection to Encinitas and the ocean. We were curious to ask what inspires Skye for his murals and what he personally prefers to paint. Such an awesome mural for Ecwid couldn’t have been born without his personal love for Encinitas. Encinitas is home. It’s a spiritual surf town that is a one-of-a-kind place in the world. Always happy to take trips and come home to this wonderful town. Remember California Mural from Skye Walker on Vimeo. I love being in nature and surfing, snowboarding, and mountain biking. Those adventures help inspire my art. While I’d love to just draw and paint all the time, that’s not possible. You have to take breaks, exercise, enjoy nature, and take time away from the art to come back to it and make it better. Is it hard to sell art? If you feel the need to do it for your life, should you find a normal job and keep art in the list of your hobbies? Seems like Skye is sure that no true artist bothers with this question. Art is and always has been a hard thing to sell, but it’s a very necessary element in our society. We need art to make us happy, make us think, help sell things… it’s crucial. I’ve worked hard to create work that people might want to buy and have in their homes… but if I never sold a piece of art, it would still make me happy to create it. That’s why I love painting murals — so thousands of people can see my work without having to buy it – they can just enjoy it. Skye has a website where he connects with potential projects and sells his works. He also posts mural updates on social media. Instagram is a great way to showcase your work and progress to a lot of people in a clean and simple way. I also use Facebook, Twitter, and my website, www.skyewalkerart.com. As a graphic designer, he thinks great design on the web is crucial. Good design is so important. It doesn’t have to be complicated; in fact, simple design is great because it makes it possible for everyone to connect to the product. We agree on this — that’s why we try to develop simple, understandable design for Ecwid stores so that even beginners can look professional and sell on the web. Should beginner businesses care about branding from day one? He believes that it is necessary for a successful launch. A good logo and branding are imperative for a brand to succeed. To teach yourself to be more artistic, all you need to do is research art and design you like and investigate the things that connect to you. Stay focused and don’t be distracted by anyone saying you can’t or shouldn’t follow your dreams of being an artist. Take any and every opportunity (within reason) to showcase your work. It takes time, but if you’re diligent… it will pay off in the long run.